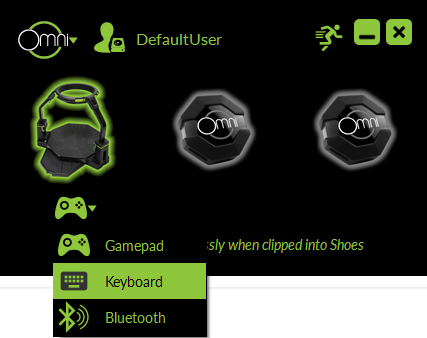 Click on the gamepad icon and select the keyboard icon to enable Keyboard Mode. Set the game being played to keyboard mode instead of gamepad mode. This may require going into the options menu of the game. The game being played must be compatible with movement using a keyboard. Some games that can be played using keyboard mode include: The Assembly, Alice VR, Mind: Path to Thalamus, and AltSpaceVR. You can search for other VR games that allow for this input mode on digital VR storefronts.